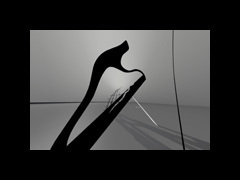 Each video is an experience of a particular virtual sculpture. Although the equations which define these sculptures can be translated into physical objects, our focus is to present a new way of conceptualizing and relating to 3-dimensional form. They are intended to be viewed independently or in conjunction with the still photographs featuring the same model.